When I lived in southern California I used to say that my recipe for guacamole began, first plant an avocado tree, wait ten years, then pick a ripe avocado. Luckily, my recipe for egg-free potato salad doesn’t take that long. I have shared with many of you how I’ve had success growing potatoes in translucent plastic bins and you have asked me for details. 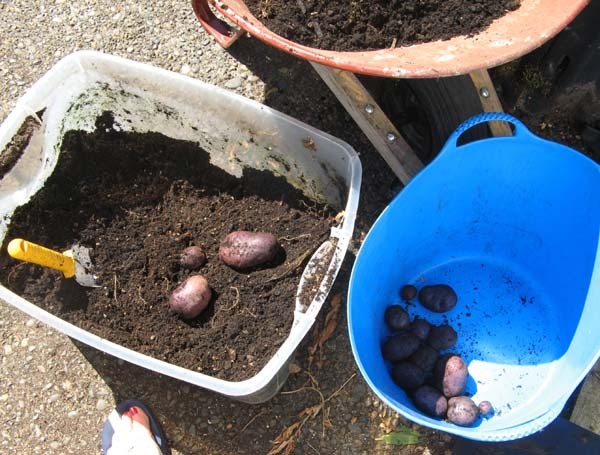 So, I’m going to share my recipe for the season’s freshest potato salad that begins, first prepare your planting bins . . . I use ordinary storage bins that are translucent plastic and drill 6 holes in the bottom. 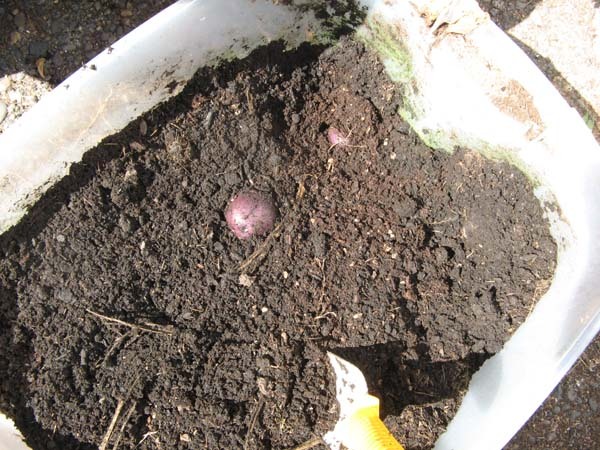 I fill the bins with about 4 inches of good soil, and push the potato starts into the soil, making sure they are covered. You can purchase the potato starts locally. I got mine from Lowes this year. Last year I just let some organic potatoes sprout and then cut them up so that each piece had a lovely green sprout. 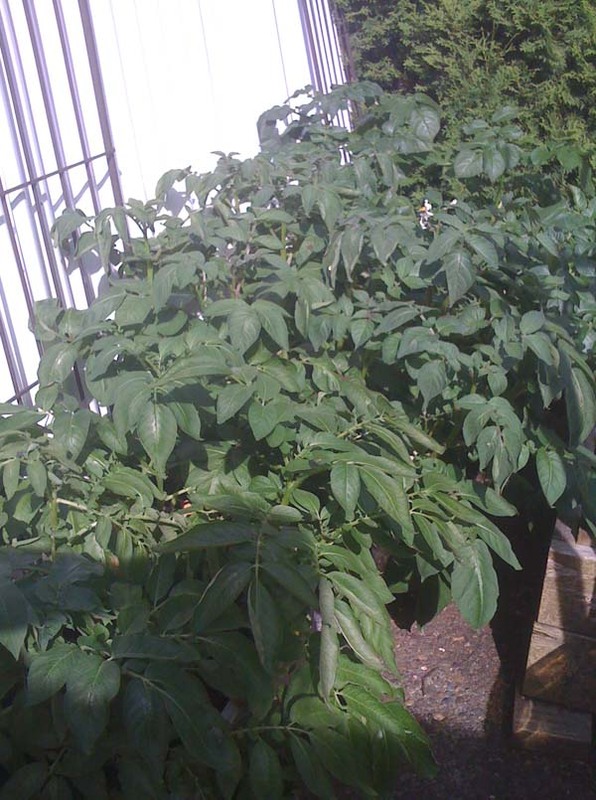 You don’t want to cut them too small because the bit of potato will “feed” the sprout and get the plant started in the soil. As the plant grows, just keep adding soil and covering up some of the green vines and leaves. 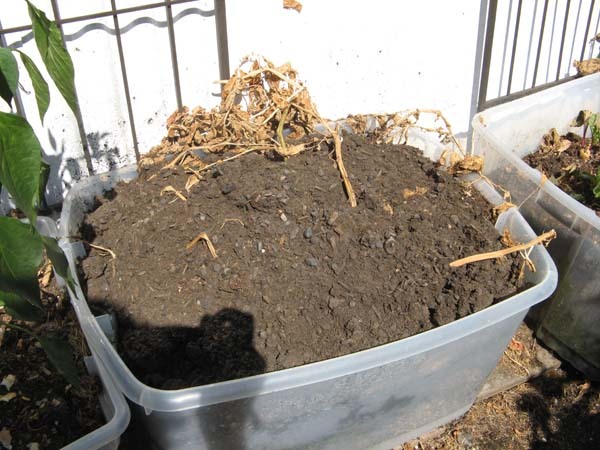 Eventually, the entire bin will be filled with soil and green leaves. Then just let the plants grow and get full. Water as needed and feed them when you feed your other plants. When they are growing happily they will look like this. After a few months, the vines and leaves will turn brown and start to biodegrade. The plant will look really pitiful but don’t worry – this means that your treasure trove of potatoes is ready to uncover. The plant will look like this. Now you are ready to dig up the taters. 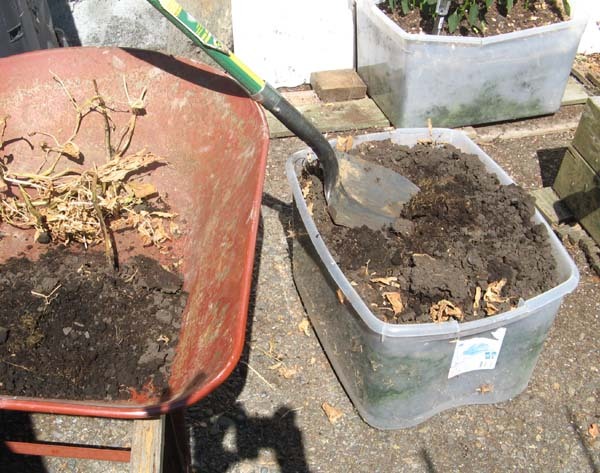 You will need something to put the dirt into as you remove it from the bin, I use a wheelbarrow. I use a plastic bucket to put the taters in. Other useful items are a shovel, hand trowel, and gloves. Begin by removing the old vines – I always say thank you to them because they brought in the nourishment that helped create the tubers that are hiding in the soil. 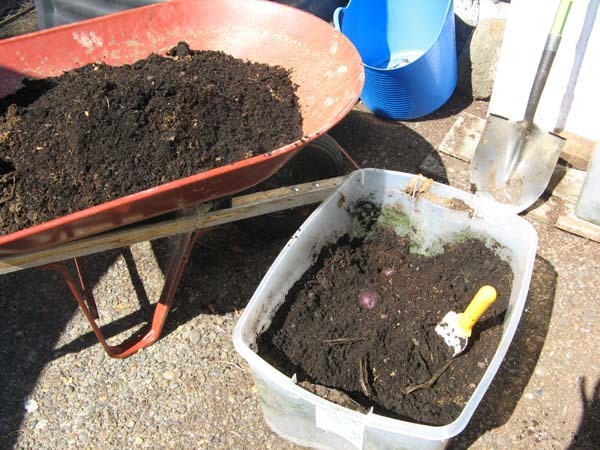 Then very carefully shovel out some of the dirt from the top of the bin. You don’t want to dig too deep otherwise you will damage the taters. Next, use the hand trowel to carefully remove more dirt. Once you are about half-way into the bin you will want to become very cautious and use your hands to feel for the potatoes in the soil. Use the trowel to loosen the soil to make it easier for your hands. You will find the potatoes and they will be various sizes. Place them gently into the plastic bucket. Don’t worry if they have dirt on them. You will wash them before taking them inside. You want to avoid scraping, puncturing, or otherwise damaging the taters when you harvest them. 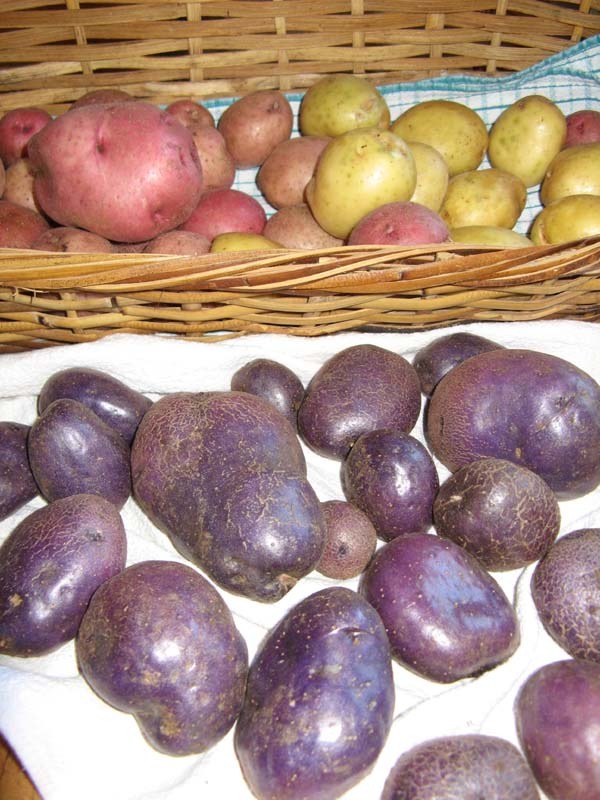 These are purple potatoes called Adirondack Blue. I also grew Yukon Gold and a Red variety. You’ll see all of them in the recipe. 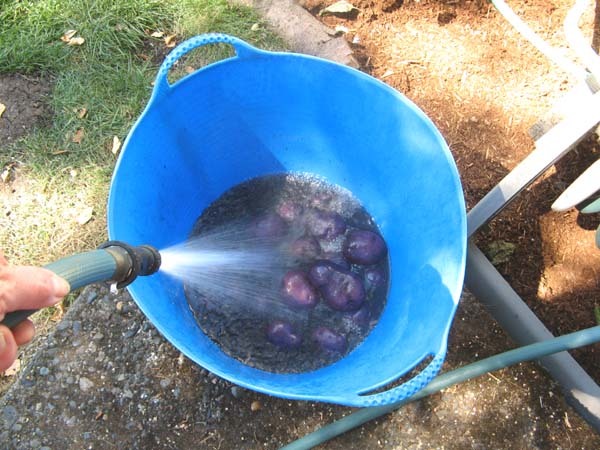 Once you are sure you have all of the potatoes out of the bin, take the bucket to the hose and give them a good washing. You can gently get as much dirt off of them as possible. This usually takes a couple of washings. Once that is done, bring them inside and give them another washing in the sink. Then dry them off with a paper towel and spread them out in a dry, cool place. After they have air-dried for a few days, I put them into my potato basket with the other potatoes that I harvested earlier. I don’t grow that many so I don’t have to worry about long-term storage. They are so incredibly delicious that they don’t really last very long, although I try to “pace myself” with them. They will last just fine as long as they have air around them and don’t get too hot or damp. 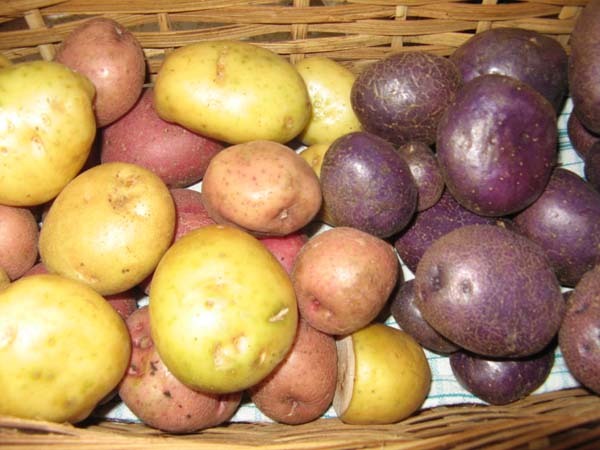 Now that we have grown the taters, it’s time to make something with them! 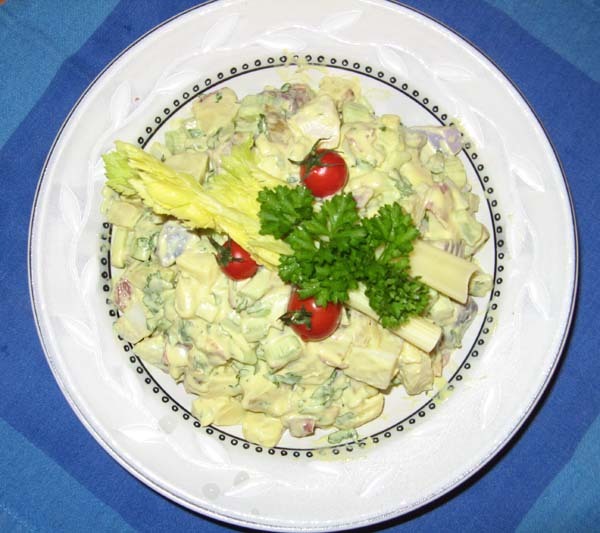 What could be better for our last warm summer days than potato salad. I’ll give you my recipe and show you something you can do with the salad as well. Here goes . . . Potatoes, celery, parsley, bacon (optional), Vegenaise, yellow mustard, salt and pepper. I like to use organic ingredients whenever possible and the Vegenaise is vegan so it doesn’t have eggs but tastes great. 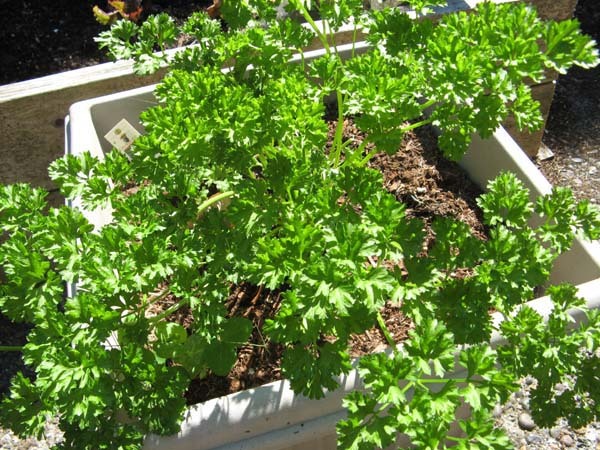 And I grow parsley so that’s really fresh and delicious. Select the potatoes and boil them in water. The fresh ones from the garden will take a very few minutes to cook, especially if you cut them up. I like to keep an eye on them and do a fork test so that I know when they become soft (nothing worse than hard potatoes in the salad) but not mushy.Drain the potatoes once they are cooked and let them cool. I sometimes put them in the fridge overnight just to ensure they are cooled completely. You can fry the bacon ahead of time also. Time to put it all together. Chop the bacon, celery, parsley, and potatoes and set aside while you combine some of the Vegenaise and mustard in a mixing bowl. 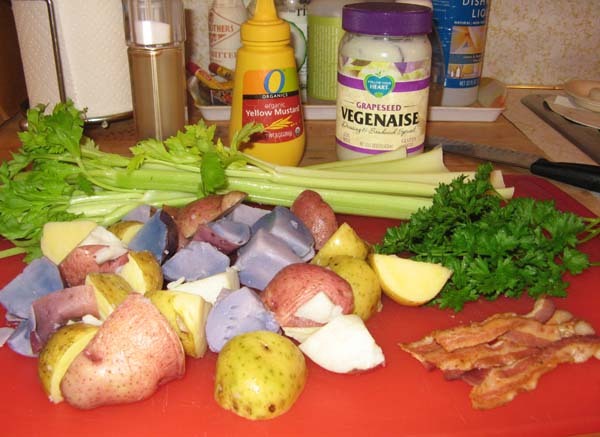 I usually do 3 parts Vegenaise to 1 part mustard, but you can make it more or less depending on your taste. Add salt and pepper to taste and stir to mix. Add the chopped items and gently fold to mix. Taste and add more salt or pepper if necessary. Put in a pretty bowl, garnish with celery, parsley, and tomatoes. Enjoy! 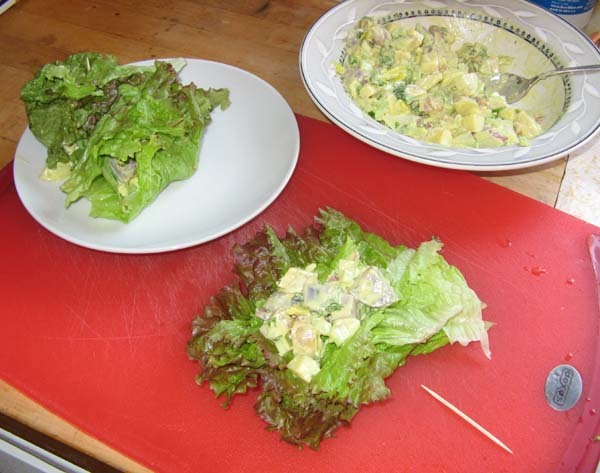 Here’s something you can do with the potato salad if you have leftovers or you want to try something different – Rainbow Potato Salad Lettuce Wraps. Wash some organic lettuce leaves, dry them, and put some of the salad on one leaf at a time. Gently fold the leaf over the filling and secure with a toothpick. Perfect for a hot day! One of my favorite things to do is to share the food that I make with my friends and neighbors. Marie is often the person who gets to sample my cooking. 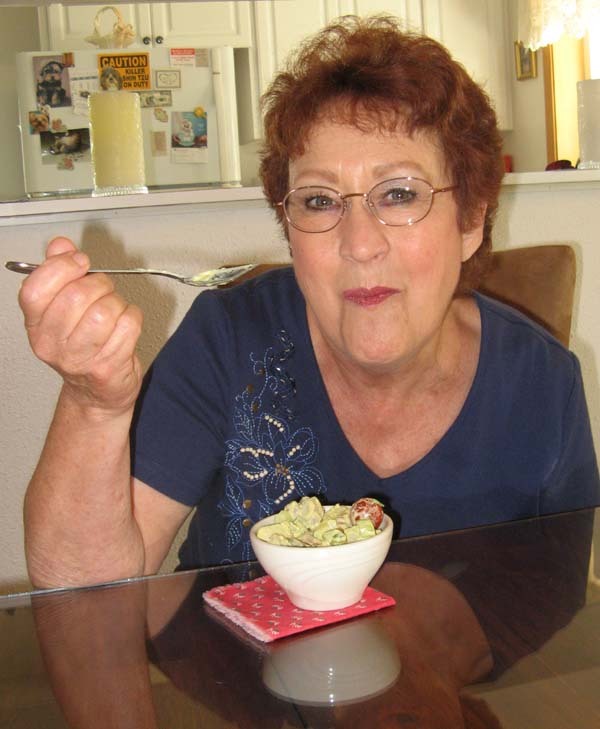 Here she is enjoying the potato salad. In her words, “it’s great!” Thanks, Marie! So, what did taters teach me? Sometimes a great recipe takes time but the best things are well worth working and waiting for. And potatoes fresh from the garden are one of nature’s delights. I’m already thinking about how to expand my potato patch next year! Wow, what a great detailed description of the process, I’ll have to give it a shot!